All posts tagged: What are GARP Stocks (Growth at a Reasonable Price)? If you have been investing intelligently in the stock market, then you definitely would have heard about ‘growth‘ and ‘value‘ stocks. These are the two extreme kinds of investment strategy in the market. The growth investors focus on the growth of the company and are ready to pay even a higher price if the company is growing at a fast rate. On the other hand, a value investor ‘values’ his money and only believes in buying undervalued stocks. A value investor will buy the stock only if he finds its price way below its intrinsic value. There’s also a third kind of stock called dividend/Income stocks, however, growth and value are the ones that get most of the attention. Anyways, you do not always need to choose between growth or value investing strategy. There’s also an option for hybrid stock picking strategy which has the combined characteristics of both growth and value stocks. These are called GARP Stocks or ‘Growth at a reasonable price’ stocks. In this post, we are going to discuss what are GARP stocks and how we can investigate these stocks. However, before we learn more about GARP stocks, first you need to understand what are growth and value stocks. Here’s the ‘simplest’ definition that you can find for these two kinds of stocks. What are Growth and value stocks? We can define a growth stock as a company which is growing at a very fast rate compared to its industry and the market index. These stocks have a large PE ratio. Because of their high growth rate, the investors are ready to buy these stocks at a premium price. 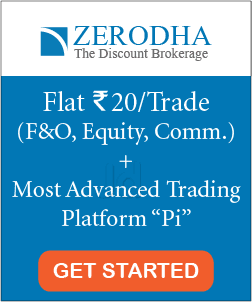 They understand that these stocks won’t be available at a cheap price as they are performing well consistently and hence if they want to enter that stock, they have to buy at a high valuation. Nevertheless, as long as the company is performing well and growing at a faster rate compared to its industry, even buying these stock at a high premium will give those investors a good return. Value investors believe in buying the super cheap company through finding its intrinsic value (using company’s fundamentals) and comparing it with the current market price. The growth rate of these stocks are way below that of the growth stocks and that’s why they have a low PE and are (generally) ignored by the market. These investors look for an opportunity to buy these stocks which are way less valued in the market (because of whatever reason) than it’s intrinsic value and buys it. A value investor is confident that this stock will rise to its true intrinsic value in future. He holds that stock until it goes back to its normal value. Investing entirely in growth stocks or value stocks might be a little risky. Both these stocks have their own limitations. The growth stocks trade at a high valuation and you might have to overpay to buy these stocks. On the other hand, value stocks may be available at a cheaper price because there’s not much juice left in these companies and they might continue to underperform in future. Nevertheless, you do not always need to choose one of these extremes. There’s another hybrid stock picking strategy available which is the combination of the characteristics of growth and value stocks, called GARP stocks or ‘Growth at a reasonable price’ stocks. GARP Stocks focuses on those stocks which are giving a consistent high earning above that of the market level and are present at a reasonable valuation. Here, the consistent earning is the dominant characteristics of growth stocks and the reasonable valuation is the part characteristics of value stocks. 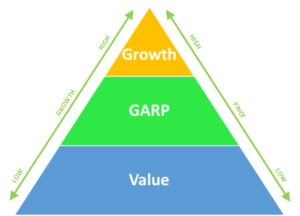 In short, GARP Stocks tends to avoid the extremes of investing in pure growth or value stocks. NOTE: GARP Investing doesn’t mean having a portfolio with 50% growth stocks and 50% value stocks. It’s the individual stocks which should have the characteristics of both growth and value stocks, not the entire portfolio. 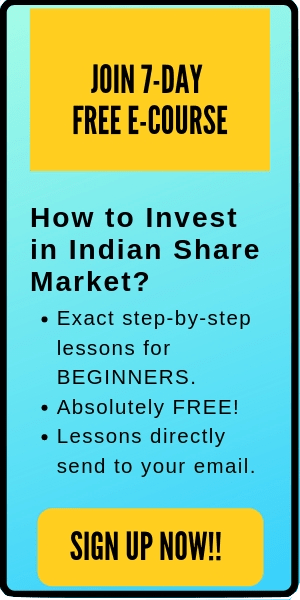 How to find GARP Stocks? GARP stocks were popularised by the legendary fund manager- Peter Lynch of Fidelity Investments. He is known for his amazing track record of annualized 29.2% returns for the Magellan fund, which he managed from 1977 to 1990. GARP Stocks were his favorites which were somewhat undervalued stock with sustainable growth potential. For the GARP Stocks, PE ratio is somewhat higher than that of value stocks but quite lower than the high PE as sought by growth stocks. Nevertheless, while comparing the PE ratio, you should follow the apple-to-apple comparison. This means that the PE of that stock should be compared with the PE of similar companies in same industry. These stocks have a good earning prospect with growth for the next few years higher than the value stock. However, GARP investors choose conservative growth rates and avoid extremely high growth estimates like that of growth stocks. Nevertheless, there are no rigid boundaries of how much PE ratio or growth should a GARP stock have. To solve this problem, the GARP Investors use PEG Ratio. For example, for a company, if the stock PE is 22 and the earnings growth is 30%, then the PEG ratio will be 22/30= 0.73. In general, Garp investors pick stocks with PEG Ratio less than 1 (preferably somewhere near 0.5). Although investing in GARP stocks sounds a good idea, however, it’s not easy to find these kinds of stocks. While researching, you might find a ‘mediocre’ stock mistakenly considering it as a GARP stock. In such case, that stock will neither have ‘value’ nor good ‘growth’ potential. Investing in such stocks without proper investigation will get you into a lot of troubles. 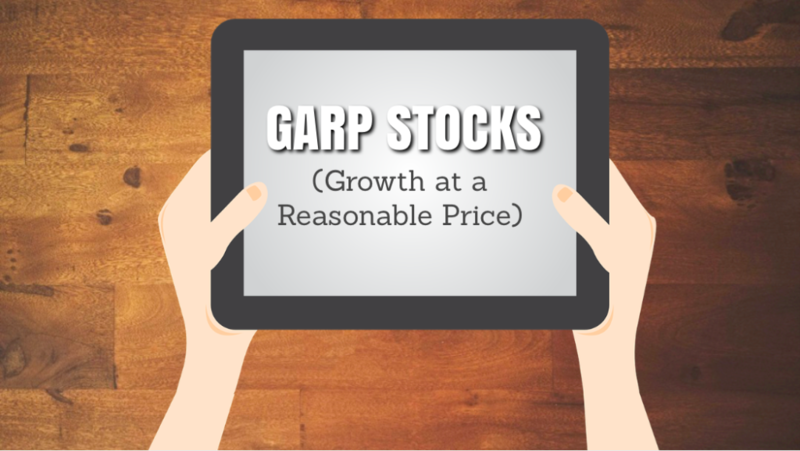 GARP stocks avoid the drawbacks of investing purely on growth or value stocks. It eliminates the risk of investing in over-valued growth stock at a high premium and avoids the circumstances of picking underperforming value stocks. Overall, investing in GARP stocks is a good approach for moderately risk-taking investors who care for both value and growth. It might not be simple, however, it’s worth investigating. That’s all. I hope this post is useful to the readers. If you have any questions regarding GARP stocks, feel free to comment below. I’ll be happy to answer them.